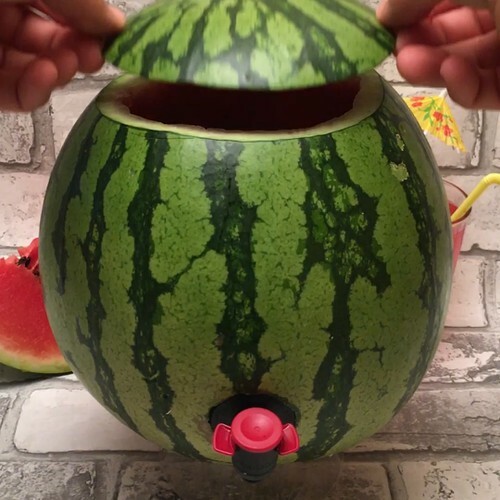 Impress your friends with this easy watermelon vodka keg! Cut the top off the watermelon and scoop out the flesh from the middle. Blend the watermelon, then pass it through a sieve to obtain the juice. Use an apple corer or knife to make a hole near the bottom of the watermelon, then place the plastic tap in the hole. If necessary, roll up some clingfilm and use it to seal the tap in the hole. Pour the vodka, brown sugar, juice from 2 lemons and the strained watermelon juice back into the hollowed out watermelon. Mix it all together. Serve by the tap and add ice cubes and mint leaves to each glass of cocktail. Cheers!